Kuala Lumpur – Boyfriend first came up as lovely cute boys with their debut single "Boyfriend” on May 2011. Consisting of Kim DongHyun, Shim Hyunseong, Lee JeongMin, Cho Youngmin, Cho KwangMin, and Noh MinWoo, Boyfriend (Korean: 보이프렌드) is a six-member South Korean boy group under Starship Entertainment. They are the first boy band to have twin members. Their official fanclub name is "Best Friend". Boyfriend gauged up the fans’ expectation and anticipation of their first mini concert in Malaysia by going through lots of concerts successfully over the world such as Japan, Taiwan, China, Thailand, the United States, Puerto Rico, and other countries as well. After four years of long wait, they are finally able to meet their fans in Malaysia for Boyfriend the First Mini Concert in Malaysia “Bewitch” 2015, upon fans’ love call. 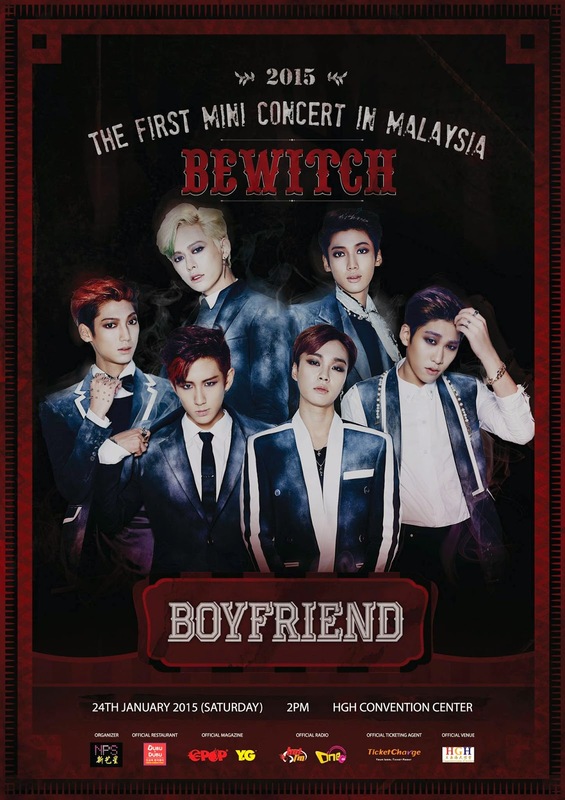 Boyfriend the First Mini Concert in Malaysia “Bewitch” 2015 is proudly present by New Pro Star that brings hallyu wave to the shore of Malaysia since 2012 with a star-studded line up of the idols from South Korea such as Running Man Sparta Kim Jong Kook, MIK, AlphaBAT, The Boss (DGNA) and EvoL. This mini concert will be held at HGH Convention Centre on 24th January 2015. Please come to New Pro Star office starting from Monday, December 15th, at 2pm. Fans can come from Monday to Friday (2pm to 6pm). Please bring along your ID.